A workbench is an unvarying need of every garage. There are so many things that you have to keep in the shelves and on the table for storage purpose. I mean, after the usage, you got to put all the things in place. While most of the people will want to buy a workbench from the market, we say, make your own in few easy steps. This way, you can ensure the high quality of the bench plus it will cost you much cheaper. You can make the customized bench according to your choice and need. There are dimensions that you can keep according to the space where you wish to fit the bench. But most importantly, because you cannot be sure of the wood used in the making of a bench, you can easily pick the finest wood for custom-made workbench. Understanding the fact that a workbench is used for heavy-duty tasks, it has to be strongly built and rightly constructed. And, not to forget, you can design it the way you want like give it a rustic or fashionable look as per your choice. The trend of making custom workbench top at home is quite popular among the makers and DIYers, we would like to introduce you to the ways on how you can make an economical workbench. 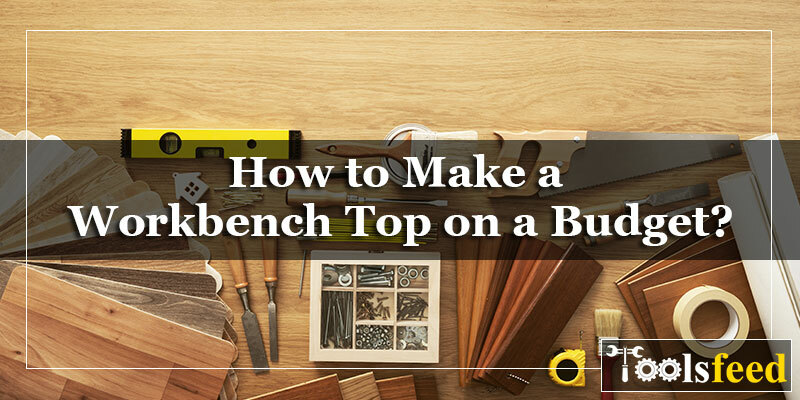 Since the topic of today is budget-friendly workbench top, we have to make sure that all the products that we pick cost us as minimum as they can. Its just a small wood plank that will be needed for making the benchtop, we recommend to borrow it from some carpenter. They will be happy to lend since you can use the waste pieces from their work place. They will dump it anyway so why not to gather around some courage and ask for it. You can also ask for the plank from the scrap people. They will charge you very few money for it. I can share one more alternative with you. Wait for a steaming hot day and take some beer with you on the construction site and trade your way with the construction people to give you the lumber for free. The ply sheets are available in different dimensions such as 4 x 4” or 4 x 2”, 2 x 2” and many others. In order to pick the right wooden planks, you first have to measure the space and keep an account of the wood size required by you. Even if you have brought home larger pieces, you can still work with them that is you can cut them in the required dimensions. But if you get the appropriate sizes then this will save your time. So, now you have the raw material and the preparation for the actual task is done. One of the biggest cons of picking the lumber from here and there is that these pieces are as high in quality as you can find at a lumber yard. Of course, the quality is questionable that is why it was there in the dumpster or on the pile of waste lumber and not in a shop with high price tags. So, in order to make the wood useful, use the saw and nails to fix the broken parts or cracked wood. This way, your wood will be prepared to be used. Plus, it can provide decent durability. By this time, your wood is completely prepared. Now, you can start with the cutting. All the parts of the workbench have to be prepared separately, polished and then combined in one full sized table. So, we will help you know the order of cutting different parts of the bench. First, you should start by cutting the legs of the bench. Because these are the 4 wooden pieces that will be holding all the weight for the time the bench will be used, the wood you use for the legs should be of the best quality. Take the wood in your hand and figure out the pieces that are the strongest. Then cut them in the diameter that you require for legs. Make sure all the pieces are cut in same diameter. While cutting the wood, you must keep in mind the height of the table as well. The measurement of all the pieces has to be accurate and very well thought-out. We recommend you to take a scale and then measure the parts carefully. It depends on the size of the table because some people also prefer making 3-legged table which has trouble balancing properly but people work according to their need. Well, we will recommend to either stitch the table shelf in the wall or make a 4-legged table. Now, once the legs are done, you should move to the back braces. For this, you have to ensure the length of the table so that you can cut the braces accordingly. For instance, if you want the bench to be 6 inches tall then you can make 3 braces in total with 2 on the back and 1 in front. The top 2 will provide support to the bench plus it will also provide help when you will have to attach your table top. Then you can work on the side braces for which you have to figure out the depth of the bench. For this, you will need 4 braces, 2 for each side. This will help you to put a shelf on the bottom. In order to proceed, you will need a mitre saw. If you haven’t purchased a mitre saw yet then this project will give you a good excuse to make the purchase. Each of these cuts will take only few seconds. With a circular saw, the complexity will be more because you have to cut one side than the other. It is best to check if you took the right dimensions before wrecking the entire thing. Best is to align the legs first and a squared brace along with. This is to ensure that all the components run in one line as planned. Please make sure of the level as you try to get the shelf brace on. Then, you should drill the pilot holes in all the braces before you put them together. this way, things will go accurate and smooth as planned. Once you have made the pilot holes in the wood, you can now place all the pieces together and club them in one. Place two of the legs on semi-even surface and run 2 braces along the top. It is the time to stitch them now. Ask someone else also to check for the coordination of the pieces. You can also use a square to measure the accuracy. If you have made a lower shelf as well, you should measure that too. Its time to build the side supports that you will require in F shapes. The side supports has to be made in same position like you have made the table. So, be very careful about the dimensions. Your table will need two F supports so be sure to do so. At the end, put both the pieces together. you can use quick release clamps for this. You can simply align them and drill. When the entire structure is made, the last part is to give it a suitable head. Well, a thin plank has to be cut as per the dimensions of the body. Best is to measure the top of the frame so that you can know the exact dimensions of the plank. Confirm it twice and then proceed with the process. Top is relatively easy as you have already finished the most complex part of making the workbench. It will be better if you can cut the length first and then proceed towards the width. Well, once you have fixed everything in this, just place the table top at its position and then use the screw nails to rigidly fix the top on the frame. This way, the table will not break easily and will be able to endure more weight. Wood will look too dull and boring. So, now, its time to decorate the table. You can use paints to of course, paint the table or use the ply wood in decorative designs to stitch on the top and beautify the table. If your kids are fond of painting then you can leave rest of the task to them and allow them to work their imagination. Since the workbench is going to be in the garage, it will not come in routine sight of the people visiting your place. And your kids will really love painting the table that you have prepared. Decorate it the way you want and the table is ready to be used. As you can see, not a lot of money is used while preparing the workbench. That is how I made my table. You can too make it easily.